Welcome to part 6 of our Snapchat Influencer Q&A series, where you can learn from the masters as we deconstruct the techniques used by Snapchat influencers. 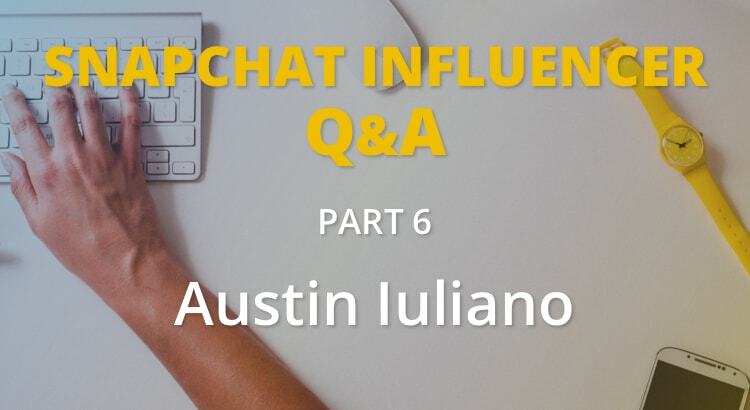 Today we are speaking to Snapchat Strategist, Influencer and Storyteller, Austin Iuliano. Austin uses Snapchat to make sales and drive traffic to his website and we are here to find out how. 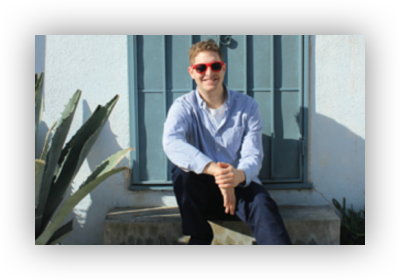 In this interview Austin tells us how he has built his Snapchat audience, plans for the future and how you can generate and track traffic and sales from Snapchat. Q: Hey Austin, it’s great to meet you! Could you tell us a bit more about yourself and what you do? Hey Jason, happy to be here! I call myself a Snapchat Storyteller. To me this means I use Snapchat as a way to tell a story and a message. Usually with the purpose of making people laugh. Maybe this will look like me pretending to be Harry Potter for Harry Potter day, or just doing ultra embarrassing things to push social boundaries. Q: When did you first start using Snapchat, and when did you realise it’s potential? I started using Snapchat right from the get-go, when is was still a sexting platform. I didn’t get it until much later. I didn’t fully realise it’s potential until Gary Vaynerchuk started pushing it. He was right about Instagram in 2015 and I am kicking myself now for not building an audience earlier. Snapchat as a marketing tool is a 100% must if you are targeting millennials. Also if your business is built on relationships there is nothing stronger out there today. In my online master course, snapchatmastery.com, I share the secrets to using Snapchat for sales and traffic. From a B2B perspective it is only topped by Facebook advertising which I think says a lot since it is a much newer tool. Q: Do you believe Snapchat can be as effective as Facebook, Twitter and Instagram for driving sales and traffic? Yes, in an article on SEMRush I shared how I used Snapchat to drive traffic. The results speak for themselves, Snapchat has attention and attention + storytelling drives traffic and sales. Q: How do you measure traffic and sales from Snapchat? Traffic and sales is easy to measure. 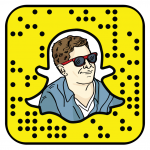 Use Bit.ly to measure how many links are being clicked and go to a specific landing page only for Snapchat. Q: How have you built your Snapchat following and what do you plan on doing to carry on growing? Short answer is hustle. Long answer is collaborations, content and guerrilla marketing. I have 5,000 Snapchat QR code stickers that I sent to my audience and I give away. I mail them to anyone who wants them. Q: What tips would you give to someone who is just starting to build their Snapchat audience? Collaboration and community are the way to go. Snapchat isn’t about you, it’s about how you get community engaged with what you are doing. Make it interesting and ask them to participate. Harris Markowitz, Shonduras, Hackapreneur, iamnickrobertsons and producerkcm. Scan the snapcodes below to add them! Q: Do you use takeovers to connect with other influencer’s followers? If so, how do you go about arranging them? Yes, I find other influencers with a similar style. I would rather focus on having a more focused audience than a bigger audience. Once I find them I approach them with a collaboration and story in mind that would resonate with their audience. I can’t stress enough how important it is to come prepared. Don’t ask them for their audience and for them to do all the work. Q: Do you believe Snapchat marketing can work as well for small businesses as it does for building personal brands? Every social media is just a tool. Right now it is extremely effective for small businesses that have some location based service because of the custom geofilters. If your demographic is on there and engaging with you it will work. First, if you want to learn how to market on Snapchat then you should watch the people who are doing it well. Myself inlcuded so add me! Second, I created an entire course on how to market effectively on Snapchat called snapchatmastery.com, you should pick it up if you are serious. It is a complete a-z guide for only 250 bucks. #1 Snapchat is a 100% must if you are targeting millennials. #2 Use a unique Bit.ly link to track you Snapchat traffic. #3 Collaboration and community engagement are the keys to growing on Snapchat. Thanks Austin for taking the time to share your knowledge and opinions. To connect with Austin, scan the snapcode at the top of this article or add him @austiniuliano. If you enjoyed this post then please check out more of our Snapchat Influencer Q&A series.